I’m birding from my window on this cold wintry day. We just got two and a half inches of snow on the ground on top of the two that we already have. 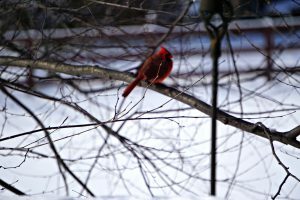 Not only is there snow covering the landscape but the ground is also frozen right now with temperatures at 10 degrees F. That may seem pretty mild for some people but it is enough to prevent my backyard birds from getting to their regular food sources. Food sources such as berries on bushes, seed from grasses, and even hiding places that the birds use to place seed for retrieving later. What can you do to help the birds out in these circumstances? You place feeders in your yard. Feeders meaning more than one. Why you ask? 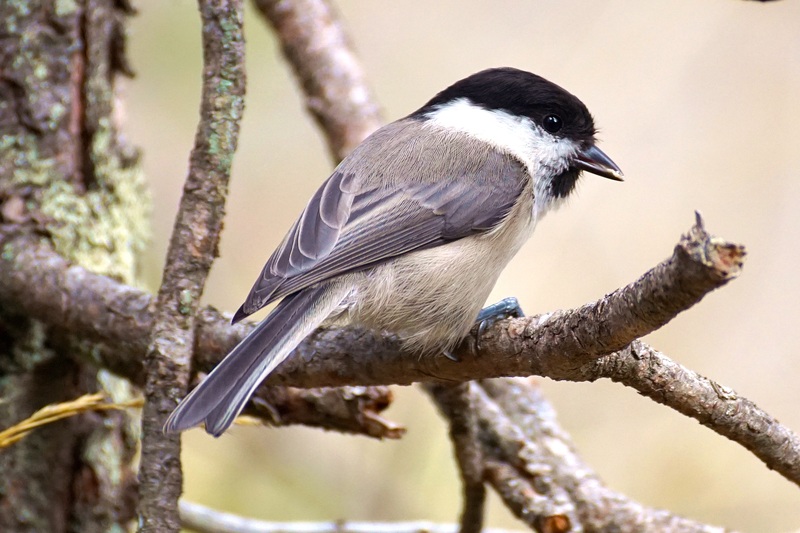 The reason is because bigger birds such as the doves, blue jays, and starlings tend to get aggressive with the smaller birds like the little chickadees, wrens, and titmice and keep them from getting to the feeder. By having two feeding stations or more you can alleviate some of the aggressive behavior. For example, I have a platform feeder for the bigger birds (the smaller birds also use it when they can) that contains a fruit and nut mix, a hanging bird feeder that is attached to a pole off of my deck that contains a supreme fruit and nut mix for the smaller birds to use, two thistle feeders for the finches, pine siskins, nuthatches, chickadees, and sometimes doves, and two suet feeders for all of the birds. 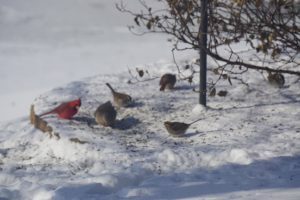 On this particular day since the ground is frozen and covered with snow I also throw seed on the ground underneath my platform feeder for ground feeders such as the dark-eyed juncos (snow birds), sparrows, and cardinals. 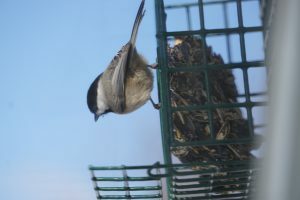 This is in addition to seed that I put on the ground near my patio that has some shelter from the elements and close to shrubs for easy and safe entry and exit for the birds and also my deck railing for easy viewing. I am kind of a bird nut if you haven’t noticed so this may be too much for you. Really two bird feeders are fine, one more for the bigger birds and one for the smaller birds and/or ground feeders to access. A premium quality fruit and nut mix will attract the most assortments of birds and is what I use. You may want to add a suet feeder especially in winter as it has fat in it which provides more energy for the birds to be able to stay warm. Just keep in mind where you place your bird feeders. A free standing pole away from any trees or your deck will help to keep the critters off of it if you don’t want them to invade your feeder and eat everything. Additionally, you can purchase bird feeders that are squirrel proof, some are more effective than others. Back to my bird watching. So far at 11:00 AM I have spotted a hand full of blue jays, lots of cardinals, a carolina wren, several house finches and gold finches, about 3 or 4 carolina chickadees, a downy woodpecker, a red-bellied woodpecker, three tufted titmice, red-winged blackbirds, plenty of pesty starlings, mourning doves, white-crowned sparrows, house sparrows, a small group of american robins, and dark-eyed juncos or snow birds as some people call them. Needless to say I have put seed out more than once today. That’s another thing that I forgot to mention. On days such as this keep an eye on your feeders. Many birds are coming in to feed and depleting them fairly quickly. So make sure that you add more seed when it disappears. It’s cold, snowy days such as this that the birds really need some help getting food to keep up their energy. 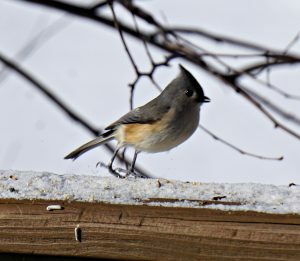 Having a few feeding stations for them is a plus, one for the bigger birds like the blue jays and doves, and one for the smaller birds such as the chickadees, titmice, and wrens. 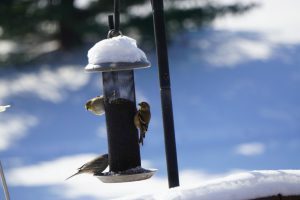 More than one feeder is suggested because the bigger birds tend to get aggressive with the smaller birds shewing them out of the feeder and keeping them from getting food. 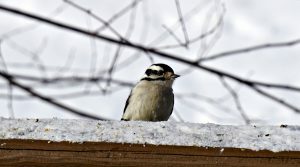 Suet is an added bonus for our feathered friends as the fat content in it provides needed energy for the birds to be able to survive the freezing temperatures. Throw some seed on the ground too as the ground feeders will appreciate it. If you don’t like the idea of messing up your lawn then you can purchase a ground feeder for your yard. One more thing! 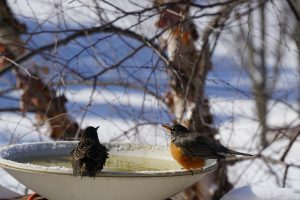 Don’t forget the much needed bird bath (heated) for birds to get a drink and for bathing (see photo above). Posted in Bird Feeders, Landscaping For Birds, Wild Bird Food. 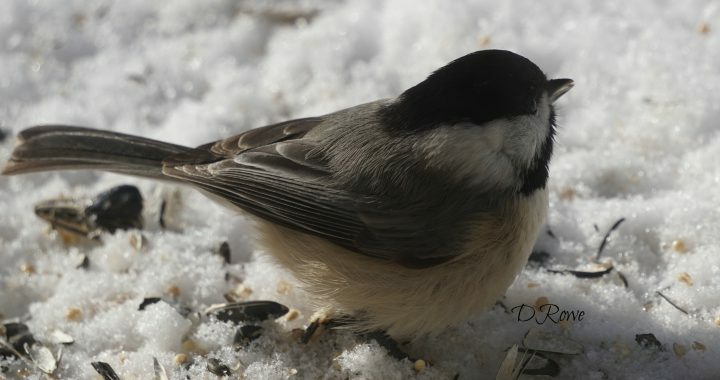 ← How Do Birds Keep Warm?